In bowl mix together your water and yeast and sit and let yeast proof for about 5-10 minutes. Once proofed add in your oil and sugar and stir. Next add in your flour 1 cup at a time until desired consistency is reached and turn out onto floured surface and knead dough until smooth. Place in greased bowl, cover and set in warm place to rise for about an hour. Meanwhile preheat your oven to 375 and grease a baking sheet with non-stick cooking spray. In bowl combine your spinach, cream cheese, sour cream and mayo an mix until creamy. Stir in your onion and cheese until combined. Set aside. Once dough has risen, turn out into floured surface and roll out into a 12"x15" rectangle. 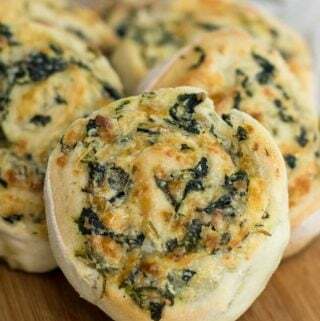 Spread your spinach dip onto the dough and roll up tightly. Cut into about 1" sections and place onto greased baking sheet and bake for 25-30 minutes or until dough is golden and dip is bubbly.